After you beat the eggs add all the ingredients except flour and mix well. Add the flour blend. Line a bread pan with parchment paper and pour the bread mix in. 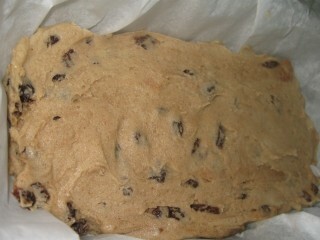 Take a wet spatula and smooth the dough flat. Cover the bread pan with aluminium foil. 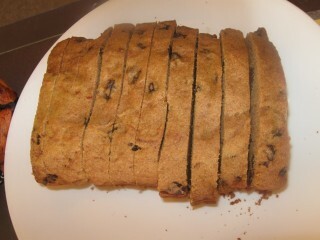 I added a cup of raisins and some cinnamon for this loaf! It’s the moistest gluten free bread he’s ever had. It doesn’t crumble when you try to eat it. Bake at 350 degrees for about 40-50 minutes. Let it completely cool before cutting.